Nunukul Yuggera dance group perform Welcome to Country. 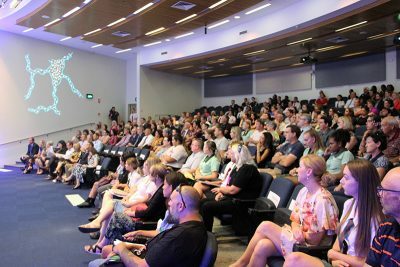 Hospitals and schools across Brisbane have teamed up to boost the number of young Aboriginal and Torres Strait Islander students taking up careers in health. Minister for Health and Minister for Ambulance Services Steven Miles and Minister for Education Grace Grace launched the Deadly Start education2employment program at the Royal Brisbane and Women’s Hospital (RBWH) Education Centre. Minister Miles said the program aimed to encourage young Aboriginal and Torres Strait Islander people to choose a career in health. “Indigenous students from as far away as Torres Strait and Weipa have been offered a school based traineeship in either nursing, allied health or dental at the Royal Brisbane and Women’s Hospital, The Prince Charles Hospital and Oral Health Centre,” Mr Miles said. “This is a great opportunity for these students to get their foot in the health employment door. “It will also help us increase the number of Aboriginal and Torres Strait Islander people working in our hospitals. “It makes sense that having more Aboriginal and Torres Strait Islander people working on our wards will help us improve indigenous health outcomes in Queensland,” Mr Miles said. Minister for Education Grace Grace said the Palaszczuk Government was committed to Closing the Gap in Aboriginal and Torres Strait Islander health outcomes. “We know that access to education, employment and healthcare can help determine quality of life and life expectancy of Aboriginal and Torres Strait Islanders and this program will help to address that,” she said. “The first intake of nearly 30 students are getting a head start on their Nursing, Allied Health or Dental careers, while maintaining their senior school commitments. 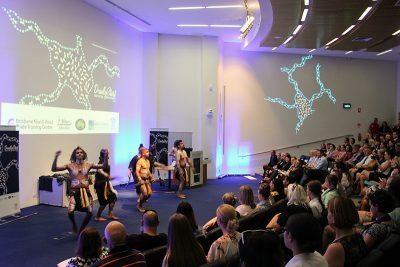 By 2031, the Indigenous population in South East Queensland is projected to reach more than 133,000 – almost double that of other states – however the number of those with clinical training is extremely under-represented, particularly in medicine. Woodcrest State College Year 11 student Sharde Smith is thrilled to be one of the first Deadly Start participants to enter nursing. With more experience in a hospital than most people her age following a childhood diagnosis of Leukemia, the now-16-year-old was able to bond with an Indigenous nurse who taught her stories and helped her understand the situation through their shared culture. “I’ve been through what they’re going through, I know how it feels so I want others to know there is someone there to help them through their hard times,” Sharde said. “This program is going to have a huge impact because I’m going to be doing what I love, giving back, changing people’s lives, saving them, so I think it’s going to be something that I look forward to everyday,” she said. Metro North Hospital and Health Service Chief Executive Shaun Drummond said that health is one of the largest employers in Queensland and will account for as many as one in four jobs in the next five years. However just four per cent of school-aged students are choosing a health pathway at school. “Without targeted recruitment, particularly aimed at young Aboriginal and Torres Strait Islanders, we just won’t have the workforce we need to cover this growing demand,” Mr Drummond said. 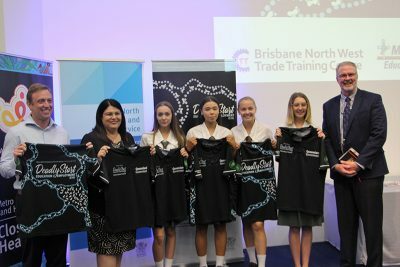 “Almost 20 schools have signed up to the program, including Beenleigh, Woodcrest, Glenala and Kelvin Grove State College, and we even have some students from Weipa and the Torres Strait. Indigenous trainees meet Minister for Health and Minister for Ambulance Services Steven Miles and Minister for Education Grace Grace. Around 200 people attended today’s launch.